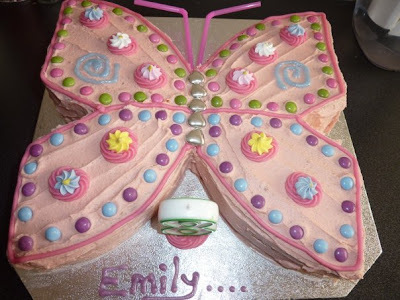 The beautiful butterfly design is taken from here... which is an amazing website for busy people that want quick yet stunning cake design ideas...It was so simple to make, using just 1 large 25cm round cake...and some rather cunning cutting!!! This one also uses the same easy vanilla cake recipe...this time baked in 2x23cm round cake tins then sandwiched and covered with a vanilla buttercream that I had coloured green. The track is just some ready to roll fondant (also ready coloured - didn't fancy black colouring all over my kitchen!!) with a bit of piped white icing for road markings...If you look closely you will see I re-use my cake boards over and over again!!! Put 175g soft unsalted butter into a large bowl. Beat with electric beaters for a few secs until pale. Gradually add 300g sifted icing sugar, a spoonful at a time. Keep beating until mixture is pale and creamy. Beat in seeds from 1 vanilla pod or 1 tsp vanilla paste. Makes enough to cover a 20cm cake. Will keep in fridge for 1 week. Bring back to room temperature and beat well before using. ...and then there were 2 for the same birthday...My son's 7th birthday was marked with a chocolate creation that his 9 yr old sister made using a basic 3 egg vanilla sponge mix, and a tub of a well known brand of chocolate fudge frosting!!! It was completed with Minstrels and a Lindt Lindor truffle...and he loved it! 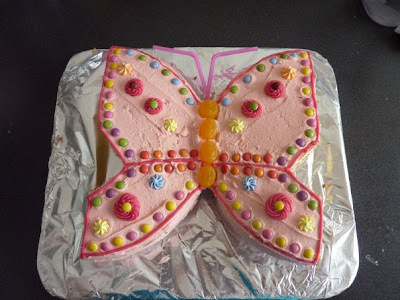 For the actual party he requested a "Haribo cake" and after seeing a traybake version at a supermarket I decided I could do a home-made take on it! I used my trusted easy vanilla cake recipe once again, and as with the race track cake, 2x23cm tins this time sandwiched with the classic combination of strawberry jam and vanilla buttercream. The outside decoration is very simply, more of the same buttercream and lots and lots of Starmix!!! The kiddies thought it was fantastic!!! and I had plenty of positive comments and recipe requests from the parents in school the next week!!! Then came the cupcake towers...they sound more impressive than they actually are...but the 2 smallish people loved helping to make, create and decorate them!!! The radishes were an inspired way to hold the extra candles needed!!!! Well I thought it was an inspired idea!!! This was My daughter's 9th birthday...and her 2nd lot of cake!!! I have somehow managed to have 2 children born within school holidays, and hence end up having 2 birthday celebrations...a family one and a friends one!!! I seem to recall the other cake was more of the same!!!! We've yet to have the friends celebration...but when we do I have been asked to make either: a Storm Trooper helmet, a Tardis or R2D2!!!! No pressure there then! I guess all I can say is watch this blog!!! Mind you that won't be until May/June time, so time to investigate possible designs.